Basal Cell Carcinoma: Abnormal, uncontrolled growths or lesions that arise in the skin’s basal cells, which line the deepest layer of the epidermis. BCCs almost never spread (metastasize) beyond the original site. Only in exceedingly rare cases can it spread to other parts of the body and become life-threatening. More than 4 million cases of BCC are diagnosed annually in the United States. It is the most frequently occurring form of cancer. And I was one of the 4 million for 2016. Driven entirely by vanity I made an appointment with a dermatologist to get the 411 on Botox, fillers, etc for the 11 lines in my forehead which I have been cleverly covering with my bangs until they get too long and swept to the side. After the litany of suggested injections, paralysis of forehead muscles, silicone and $1,000 plus for each of the 4 to 5 visits a year, I decided to stick with the bangs and get them trimmed more often. But as long as I was there almost naked on an exam table I asked her to give me a check up on a few darks spots scattered here and there. She looked at my various heres and theres (and inbetweens) and declared me to be fine until she saw a little bump under my left eye and said, “We have to take a look at this,” and she directed a beam of light onto my upper cheek. As I was thinking “oh that little bump…it’s been there for about 8 years and no one has said anything about it, just a little annoying when I put on my make-up so of course it’s nothing….” I felt the sting of a hypodermic needle in my face. I thought wtf…but said nicely (after all she had a needle in my face) “umm I thought you were just looking. “ Alas looking to her meant numbing, slicing and putting a piece of my flesh under a microscope. About a week later I got the call. “That’s a basal cell carcinoma. Better call Moe.” Huh? Moe is not Moe, but MOHS. MOHS, also known as chemosurgery, developed in 1938 by a general surgeon, Frederic E. Mohs, is microscopically controlled surgery used to treat common types of skin cancer. During the surgery, after each removal of tissue, and while the patient waits, the tissue is examined for cancer cells. That informs the decision for any needed additional tissue removal. So I did not call Moe but I did call Dr. Yehuda Eliezri in Pomona, New York, and scheduled an appointment. I was advised that the procedure would only take a few minutes but then I would have to wait two hours for the results. If all was good, i.e., they had been able to remove the cancer cells plus 1 millimeter all around, I could be stitched up and go home. If however, the cancer cells went beyond the millimeter, there would be more tissue removal, more cutting. Dr. Eliezri, a very charming man, reviewed this with me, was very gentle with the anesthetic needle and truly only took about 2 minutes to cut and patch me up with a gauze pad. Then I waited in a waiting room filled with people with gauze pads taped to their cheeks, noses, chins, necks, arms, a couple of legs, 1 foot. We looked like inhabitants of the land of the boo boo people. During my 2 hours, there were people who were called back into the clinic rooms and would emerge stitched up, with heavily packed bandages and they would head out to their cars with a wife or husband. Others however, came back to the waiting room with gauze and another 2 hours to wait. Disconcertingly, one woman came out quietly sobbing. Then I was called. As soon as I got into the hallway with the nurse she said, “You’re good to go…just some stitches;” on the exam room door I entered was my paperwork with Neg written in yellow highlighter. I had passed some rooms with the word Pos in red. I have always loved yellow highlighters. So I am home for a few days, changing my bandages which have morphed from big pieces of gauze to little strips of Telfa to now Disney Princess Band aids. I clean the incision with peroxide, dab with Vaseline and apply an ice pack every couple of hours. I also gaze in the mirror at the crescent line hash tagged with little black stitches that Dr. Eliezri so carefully placed as he kept saying, “I am bringing the edges together perfectly, no puckering, no folding,” “perfect,” “perfect.” The bruising has faded to drupelets of pale raspberries clustered on my cheek and in fact the scar does look quite perfect as a nice line under my left eye where there used to be a pearly bump. In 2 days the stitches will come out. So I have added one more landmark to my scardom which I use to track a certain personal history. The one on my right lower cheek that I have brought from babyhood as an 18 month old cut on the metal edge of a toy doll stroller. The line on my left inner knee from a swimming fin buckle that jabbed me in the fortunately sharkless waters of Long Island Sound. And my favorite, until now, my ankle scar covering the titanium screws and plate that reunited the shattered pieces of my fibula. My skin. It may seem ironic but this new scar reminds me of how lucky I have been (and now how careful I have to be) to have skin that has been broken, sliced, banged, burned, wrinkled and crinkled. And this, this one perfect scar is the only remnant of real damage. When we were kids no one used sunscreen, I don’t even remember there being such a thing as sunscreen. I grew up on Long Island where my childhood summers were daily beach outings to the rocky West Meadow Beach in Old Field to swim in the Sound and at least once a week a big packed lunch and sojourn with my friends Carol and Jim (and eventually Richard) Winkler and our mothers to the sandy south shore ocean beaches. We burned and peeled and tanned, and it was all just part of the wonderfulness of summer at the beach. As a teenager, along with my girlfriends, I slathered myself with baby oil, sometimes with the daring additive of a few drops of iodine; now I am slathering with sunscreen. And so yes, I have been lucky and I think genetically blessed. I have always given my paternal Czech grandmother Emilie Zapotocka credit for my creamy usually tanned skin and blue eyes. I remember her face as light brown, like suede, not wrinkled but with soft folds, around her blue eyes and smile, under a big braid of silver hair. My favorite picture of her is her standing in her garden in Queens, New York, surrounded by roses. But my other memories are of her making dumplings in the kitchen (a talent inherited by her daughter-in law, my mother,) cursing in Czech when she got a bad hand at cards, and her head thrown back with laughter at the Woodbox, a luncheonette in Stony Brook where she, my parents and I were eating after showing her the property they were buying to build our new house. In response to my query about a plastic tomato on the table she held it up, and gave it a squeeze which covered my 5 year old face with ketchup. My parents who had stepped away from the table looked at my red drenched face horrified until they realized that I had only been the victim of a condiment and my grandmother’s humor. She always claimed she had no idea that the tomato would spew forth upon my face. She was an interesting woman who lived with my Aunt Millie and Uncle Larry in Queens, but clearly she was the owner of the house. My grandfather had died when I was a baby, but she had a “man friend” named Mr. Hruska. One of my earliest childhood memories is being in her garden wrapped up in an old canvas hammock like a cocoon with little twinkles of light coming though the woof and warp of threads on my face, and my grandmother and Mr. Hruska singing and swinging me gently. I am sure it was quite scandalous, but we children didn’t know anything, except that she moved to Florida and Mr. Hruska moved there too. It was on one her trips back up north Christmas of 1959, that the car my uncle was driving with my aunt Millie and grandmother in the back seat, was struck by a drunk driver running a red light and the car spun on the ice so the back doors opened. Both my aunt and grandmother died, in the world before seatbelts that would have held them against the centrifugal force and saved their lives. I was 11 when my grandmother of the soft brown skin and blue eyes died, the Czech curse words and her dumpling making lost with her, and almost lost was much of her history. When we were children not only did we not know about the Hruska affair, but we didn’t really know about my grandmother’s emigration from what was then Czechoslovakia. We assumed that she and my grandfather came here together, settling in Westfield, Massachusetts , right near where my youngest daughter Alex went to school at U. Mass, on a farm where my father, the youngest child and only boy, and his 3 older sisters were born. But several years ago, my sister Barbara, the historian, began piecing together some other information. In 2005, 4 years after my father died, when I joined Barbara in Prague while she was there on a sabbatical, we met with my father’s cousin, Jarmilla, who filled in some of the family history, including my grandmother’s departure from Svaty Jakub, a little village east of Kutna Hora, which is the beautiful Czech city with the Cathedral of Saint Barbara, for whom my sister is named. The story is like a puzzle with lots of missing pieces but a strong central portrait of a very courageous, maybe impetuous, daring, risk-taking young women. My grandmother, by some accounts, 14 years old and by some 19 in 1904, left her home having, unbeknownst to her family sold her dowry collection of quilts and other household items, risking all of her possessions and money, and traveled to Bremen, Germany. From there she took a boat to New York. That seems to be the basic story. The rest is assorted puzzle pieces some which easily fit together and others that don’t, but the one fact that seems clear is that my grandmother was a teenage runaway, leaving her family, her home, her village, and her church to travel to New York, possibly alone, possibly with a girl friend, possibly with my grandfather, possibly pregnant, definitely leaving behind her a reputation for being the family bad girl. There was some information that indicated that she had been betrothed to a much older wealthy farmer whose wife had died. She may have met my grandfather and left with him, but she may have not met him until she arrived in Bremen; nothing really connects them in Svaty Jakub, since he was from much further east, although he was a traveling veterinarian. Or she and a girl friend may have just decided to try their luck in the new world. But, for independence, for love, for luck, for some mysterious reason of the heart, run away she did in pre World War I Czechoslovakia somehow traveling about 500 miles from her village to Bremen to New York where she, carrying a baby, was met, according to the Ellis Island records, by my grandfather, Ptyr Ripl. I try to imagine what it must have been like for her to step out of her house into the night and set out on such a daring journey, what plans she may have had, what hopes, what fears, what courage. She was so brave, following her heart. There is something else we do know about my grandmother Emilie. Whatever her motivation for leaving, she and my grandfather were successful on their farm, and able to go back to Czechoslovakia by boat to visit her family in 1920 when my father was 5. According to Jarmilla, this was my grandmother’s way of saying, “See I was right to run away.” And, she was right. While the Czech family endured World War I, the depression and World War II, the genocide and devastation of Nazism, and then the repression of Communism, Emilie and Peter’s family was in New York, where they moved and opened a grocery store on the upper eastside; none of us were ever hungry, threatened, deported, arrested, sent to concentration camps. We lived in the land of the free, home of the brave. My grandmother had a beautiful rose garden, she cursed in Czech, she made dumplings, she gave me my creamy skin and blue eyes, and I think she would like to know that I traveled to Prague, Kutna Hora and Svaty Jakub; I went to Nepal alone; I got off a plane in Entebbe, Uganda in the middle of the night by myself; I slogged through the monsoon in Mumbai; I lived for a week at a clinic in Burundi and swam in Lake Tanganyika. In addition to her skin, now bearing this lucky scar, I believe she slipped me a little trinket of DNA that said, “Be brave and follow your heart.” It is a genetic message from Emilie that I have passed on to my children, to be continued by my children’s children and my children’s children’s children. Thank you to gentle Dr. Eliezri and his kind and attentive staff. 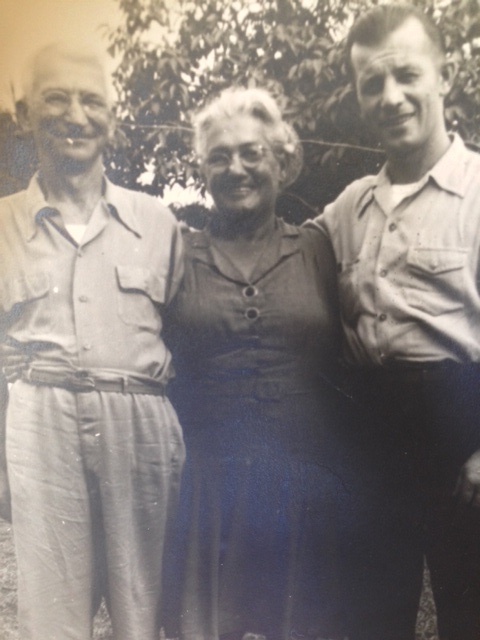 Photo above: Emilie Ripel with her husband, Peter Ripel and their nephew Willie Ripel in Piermont, New York, where Willie was the original owner of the Piermont Community Market.